We at GISE understand the importance and need for an authentic certification of jewelry where diamonds and gemstones have been used in mounted condition. To judge a diamond or a gemstone in mounted condition, is more difficult than to judge it, when it is loose. With taking into consideration the need and safety measures of the jewellers and gem & diamond dealers, GIGJ has come up with mobile lab services for bulk certification. In this case, the testing and certification work is done at the client site to make it comfortable and to minimize risk of jewellers. Jbn Gem Testing lab serving the Industry by certifying gemstones in the course of exports and imports, when ever required. It safe guards the credibility of Indian gem industry, which in turn helps the growth of exports from the country. Lifestyle products marketing is all about creating consumer appeal and we at Mindseye have nailed down the art of diamond & jewelry advertising and promotion. Our expertise in this industry will ensure that your marketing message reaches the right audience and creates the desired impact. 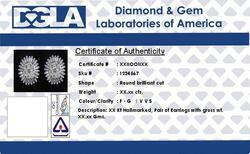 We provide Loose Diamond Certification. This report is not a guarantee, warranty, evaluation or an appraisal, but contains the characteristic of the gemstones/jewelry described herein which has been graded, tested, examined and analyzed by experienced graders at Five C's Gemological laboratories Pvt. Ltd. Subject to Mumbai Jurisdiction.